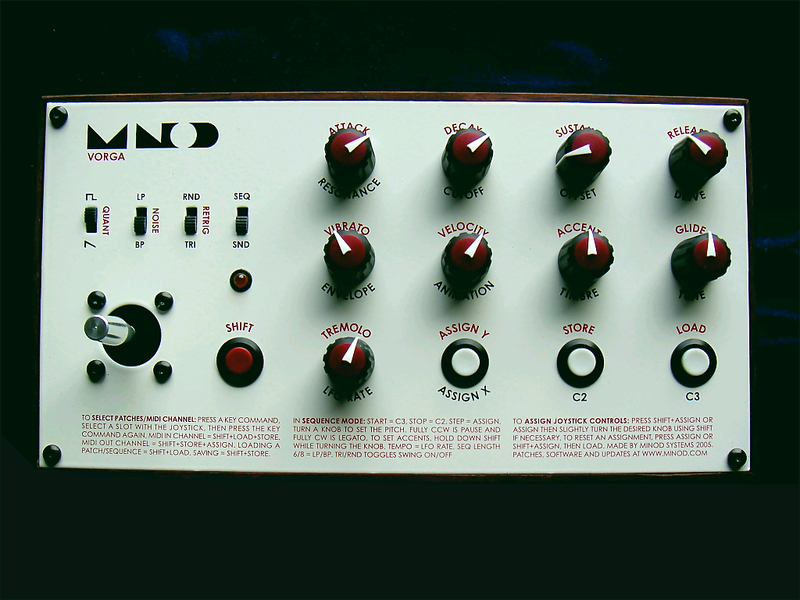 The MINOD® VORGA is a modern analog synthesizer with a very special sound. This was made entirely with the VORGA, including drums, and no extra effects. This demo was made with a prototype. It lacked the saw waveform, low pass filter and many other controls. Much effort has been put into designing a fast and easy interface on the MINOD® VORGA. Much of this is accomlished by the joystick. The analog joystick by default controls pitch bend and modulation. But any other control can be assigned to it in any combination. For example, you can have filter cutoff frequency on the vertical axis and LFO frequency on the horizontal. The joystick is also used to load and store patches and sequences and to select MIDI channels. The VORGA can store sixteen sound patches and sixteen sequence patterns. It also supports SYSEX messages to upload or download patches and sequences. 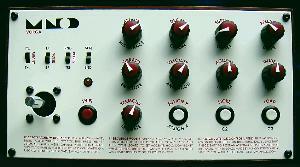 The VORGA has nine knobs and four switches. All knobs and switches have two different functions in any mode. One direct and one shifted. You will master the interface after a few minutes of practice. The red button is the shift button. 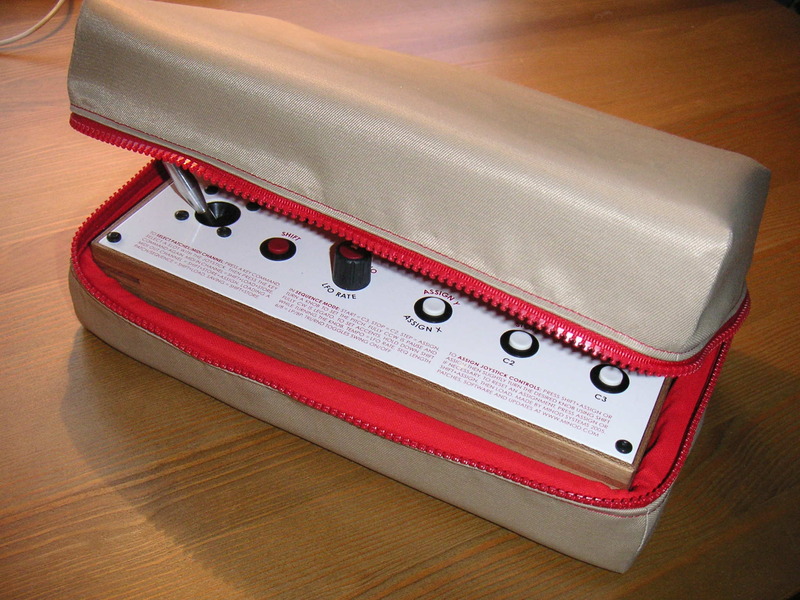 All controls sends MIDI messages, so the MINOD® VORGA can be used as a MIDI controller as well. You will probably notice the brief instruction text on the front panel on the VORGA. It may come in handy when you need to change the MIDI channel or set the sequence length for example. The timbre knob controls both pulse width and synch slave frequency. The DCO/waveshaper also has the ability to glide, animate and to add vibrato to the sound. The MINOD® VORGA filter is the backbone of its original sound. It has two modes set by a switch: 24dB Low pass (4-pole) or 12dB Band pass (2x2-pole) with variable width, where both ends are 2-pole or 12dB/oct. The cutoff frequency and bandwidth can be varied independently. What makes the filter unique is the two resonance peaks, one on each side of the band pass filter. This creates timbres not available on traditional analog synths. The drive control helps too. The filter has six parameters: cutoff, offset, resonance (dubbed Q in the schematic), drive, velocity, and envelope. The first controls the center frequency of the filter. The second controls the bandwidth. resonance sets the resonant response on both peaks. The drive controls the power driven into the filter and can give distortion effects. Velocity controls the MIDI velocity influence on the cutoff. Finally, envelope controls the amount of envelope influence on the cutoff frequencies. The LFO in the VORGA has one control for the Rate, or frequency. It goes from very slow into audio (well above 100Hz). It has a triangular or random waveform. It can be synched to MIDI. The envelope generator on the VORGA is the standard ADSR (attack time, decay time, sustain level and release time) found on most analog synthesizers. It controls the VCA output driving the filter, can influence the waveform via the animation control, and influences the filter cutoff frequency of the filer via the envelope knob. The VCA level is also influenced by MIDI velocity, as controlled by the accent control. The built in sequencer works like an analog sequencer. You set the notes by turning the knobs. Velocity can be edited for each note. Notes can be turned off or joined to the previous one. The note length can be set from very short to overlapping, to allow glide effctes. The sequence length can be set to 6 or 8, in 16ths or 8ths, straight or swing. The sequence can be transposed by an external MIDI keyboard, the internal keys or using the joystick. The joystick keeps its setting when going into sequence mode, so assigned sound patch controls can be accessed during sequence mode. The MINOD® VORGA supports a full MIDI interface. It can function as a master sequencer, be used as a general controller or playback an external sequence track. All parameters can be controlled at any time via MIDI. Using SYSEX commands, patches and sequences can be uploaded to a computer and stored for later use. The firmware can also be upgraded via MIDI as bug fixes and new features comes along. The MINOD® VORGA is made of a wooden box and an aluminum panel with large soft-touch knobs. There are several options; oak, elm, birch, or jarrah, with matte or glossy finish. Its dimensions are approximately 26x14x8 cm (w/d/h). The price is 5800 SEK, or €640 plus shipping, DC adaptor not included. The VORGA will be available for shipping in Mars 2006. Copyright ©2003-2006 MINOD Systems. All rights reserved.